In our reading today, Jesus will endure humiliating and brutal treatment from those famous for their skills in delivering it. Jesus has just left the assembly where Pilate tried unsuccessfully to have Him released. Jesus has just heard His own people cry out for His death. Now he faces the Roman soldiers and all their pent up frustration. Matthew briefly mentions the beating Jesus suffered on His way to the cross. It is tagged onto verse 26 where Jesus is delivered to the people for crucifixion. This was no minor thing though. It was a brutal, barbaric and often resulted in death on its own. It was also a precursor to any crucifixion. It would lessen the time the condemned spent on the cross by rendering the prisoner near death before even making it to the cross. The usual scourging was to deliver 39 lashes, which even the first one drew blood. By the time the process was completed, the condemned person’s back resembled raw hamburger. After they inflicted this customary damage on Jesus, He was subjected to “special” treatment. The Roman soldiers are notorious for their cruelty, and this group was no exception. I’m not sure if this part of Jesus’ ordeal was conducted in the same place He was beaten or if the beating happened in a secondary location. Jesus is in Pilate’s headquarters for this event. We are not told if Pilate is present or knows of their behavior. Having washed his hands of Jesus’ fate, I doubt he would have done anything to intervene even if he did know. For some reason, whoever was leading this “field trip” called all the Roman soldiers together to witness and contribute to this cruelty. Did they not get their fill during Jesus’ beating? Who was it who called all the soldiers together? The entire battalion was present to witness the treatment of Jesus and to contribute their own animus to the situation. The first thing they did was to strip Jesus of His own clothing. Jesus had very recently been beaten. When they placed His clothing over His bloody back, His clothing became soaked in His own blood. As minutes passed, this blood began to congeal and stick to His raw flesh. I will guarantee the soldiers were not gentle in removing Jesus’ clothing, thereby removing any blood clots that had formed in the early healing process. Jesus endured their treatment without any resistance or outcry. As many of you know, if you don’t give a bully the fear they are looking for they will up their game. These Roman soldiers were the worst kind of bully; bullies sanctioned by a cruel government, free to express their inner cruelty any way they wanted. So, as expected, they upped their game. The soldiers began to spit on Jesus and took the reed they had placed in His hands and to beat Him on the head with it. 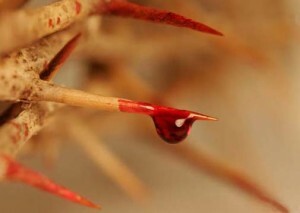 This drove the thorns further into Jesus’ flesh. We are not told how long this treatment continued. I’m assuming it continued until the Roman soldiers realized they were not going to get the satisfaction of forcing a response out of Jesus. He remained silent throughout the entire process. After the soldiers were tired of Jesus’ lack of reaction they removed the clothing and crown from Him. This brought on a fresh opening of Jesus’ wounds again. What the soldiers didn’t know was that they were actually speaking the truth as they mocked Jesus. Every time they called Him King of the Jews, they meant it as an insult. He received it as the truth it was. Jesus was the servant King, living out His calling right in front of, and for, each of these soldiers. These were the same people He would pray to His Father for in a very short time. How many of these men would later realize what they had done and regret it? Lord Jesus, You endured SO much! NO WAY could I have stood silent and accepted this treatment, let alone live through it. I would have wanted revenge on each person involved. Yet You chose to forgive all of them. When You asked God to forgive them, You didn’t list which groups You meant this for. You covered any who would receive it. You deserve so much more than I can ever give You. I have nothing to bring but my heart and my life. Even these You gave to me. Thank You for including me in the work You accomplished that day. If You were willing to forgive such treatment, I can be certain that You offer that same kind of love to me. Not that my sins are “smaller” but that Your love is infinite and amazing! Thank You, forever and always.